Sadie – I want to drop a few more pounds and then tone my muscle. I want to lift more and run faster at long distances. Sierra – My fitness goals for 2017 would have to be to keep falling in love with taking care of my body. Also, to continue becoming mentally and physically healthy! Sadie – The way I feel after completing a workout. Its so rewarding and refreshing and I just feel so much better physically/mentally/emotionally. Also, just the facts that I have the ability to workout, an opportunity some don’t get and I do every single day, so that is pretty cool! I also remember that I will never regret working out but I will always regret not working out. Sierra – To remember how far you’ve come, not just how far you have to go. You may not be where you want to be, but neither are you where you used to be. Sadie – I trained myself to run long distances. I was always a sprinter and never ran more than one mile at the time until exactly a year ago. My boyfriend got me started and since then I’ve been hooked and run almost every single day! I accidently lost 20lbs by doing this! Sierra – I have lost over 30lbs at The Center. The Center is such a fun environment and I’m always excited to get off at HaysMed to go over to The Center and workout! 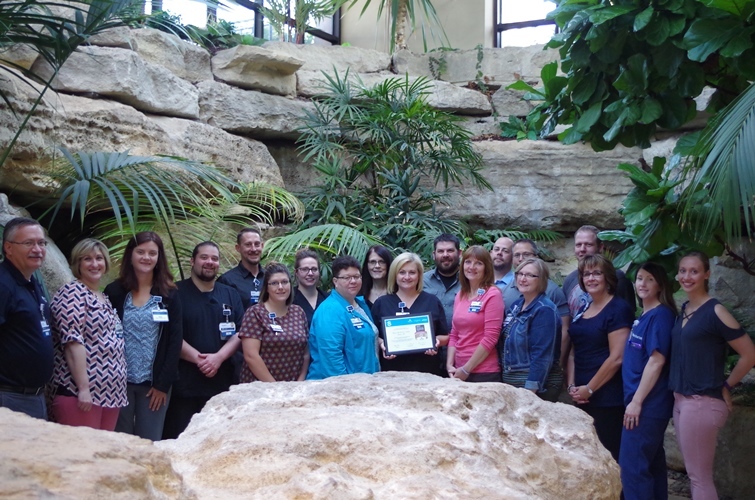 HAYS, Kansas (May 22, 2017)— HaysMed, part of The University of Kansas Health System received the American Heart Association/American Stroke Association’s Get With The Guidelines®-Stroke Gold Plus Quality Achievement Award with Target: StrokeSM Honor Roll Elite. The award recognizes the hospital’s commitment to providing the most appropriate stroke treatment according to nationally recognized, research-based guidelines based on the latest scientific evidence. To qualify for the Target: Stroke Honor Roll Elite, hospitals must meet quality measures developed to reduce the time between the patient’s arrival at the hospital and treatment with the clot-buster tissue plasminogen activator, or tPA, the only drug approved by the U.S. Food and Drug Administration to treat ischemic stroke. If given intravenously in the first three hours after the start of stroke symptoms, tPA has been shown to significantly reduce the effects of stroke and lessen the chance of permanent disability. HaysMed earned the award by meeting specific quality achievement measures for the diagnosis and treatment of stroke patients at a set level for a designated period. Hays, Kansas (May 19, 2017)— HaysMed, part of The University of Kansas Health System, will present a Cancer Symposium 2017 on Friday, June 16, 2017. The programs are jointly provided by HaysMed, part of The University of Kansas Health System, The University of Kansas Medical Center Continuing Education and Professional Development and the Area Health Education Center – West. The program will be held at HaysMed in the Hadley Conference Rooms. Registration for the program begins at 8:30 am with Breakfast and Vendor booths. The program runs from 9:00 am – 4:30pm. Topics covered include: Epidemiology of HPV disease in mean an women; recognize how to make a strong vaccine recommendation; use of evidence-based smoking cessation services; use of prescriptions for smoking cessation; increase performance in smoking cessation concordant with the patient-centered medical home measures; appropriate treatment of new drug modalities toxicity; immunotherapy, telemedicine and when to refer on; early detection and treatment guidelines for leukemia; tools to identify individuals at high risk and breast cancer survivors who are good candidates for genetic testing; update on breast cancer prevention and screening guidelines. Speakers for the program include: Gary C. Doolittle, MD, The University of Kansas Cancer Center; Kevin Ault, MD, FACOG, University of Kansas Hospital; Brandon Cunningham, MD, HaysMed, part of The University of Kansas Health System; Joseph McGurik, DO, The University of Kansas Medical Center; Barbara Pahud, MD, Children’s Mercy Hospital and Clinics; James Meier, PharmD, HaysMed, part of The University of Kansas Health System; Shawn Giess, PharmD, HaysMed, part of The University of Kansas Health System; Jennifer R. Klemp, PhD., MPH, The University of Kansas Medical Center; Edward F. Ellerbeck, MD, The University of Kansas Medical Center. CNE: Hays Medical Center is approved as a provider of continued nursing education by the Kansas State Board of Nursing. The course offering is approved for 5.5 contact hours applicable for RN, or LPN re-licensure. Kansas State Board of Nursing Approved Provider Number: LT0021-1138. Hays, Kansas (May 19, 2017) Hays, KS—The Pediatric Clinic at HaysMed, part of The University of Kansas Health System, earned the 5 Star Kansas Breastfeeding Friendly Practice Designation from the Kansas Chapter, American Academy of Pediatrics (KAAP). This designation was developed by the KAAP in collaboration with the Kansas Breastfeeding Coalition through a grant from the United Methodist Health Ministries Fund. The Kansas Breastfeeding Friendly Practice Designation includes several criteria such as having a breastfeeding friendly environment, educating staff and parents about breastfeeding, having office policies that support breastfeeding, and understanding community resources that are available for breastfeeding mothers. The entire staff at Hays Pediatric Clinic has made a commitment to support and encourage the breastfeeding mothers that they see each day to reach their breastfeeding goals through increased training and support materials. Breastfeeding has been recognized by every major health organization as the normative standard in infant feeding, with both short and long term important neurodevelopmental benefits. In Kansas, 84% Hays of mother’s initiate breastfeeding after birth, but only 48% are still breastfeeding exclusively months. That number drops to just 25% when the baby is six months old. Many women fail to reach their breastfeeding goals, and Kansas physicians want to change that. “The health benefits of breast-feeding for both infants and mothers are undeniable. We are very fortunate that our community has developed a network of committed professionals to help educate our community and support families in reaching their breast-feeding goals,” Michelle Pope, M.D., FAAP. The Pediatric Clinic is among only a few practices in the state to have earned this 5 Star rating by having access to International Board Certified Lactation Consultant (s) on site so providers can give more support to families right away from the clinic. For more information on breastfeeding go to https://www.haysmed.com/women-infant-services/. 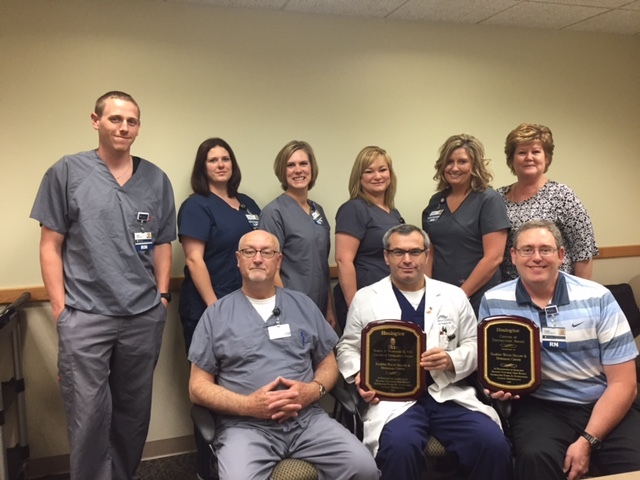 (Hays, KS – May 15, 2016) – HaysMed recognized several nursing Associates during National Nursing Week. 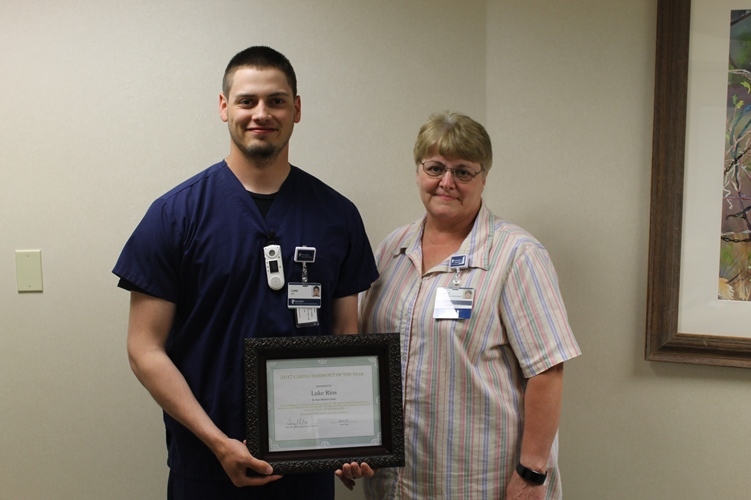 Luke Rios, Patient Care Technician (PCT) was recognized with the Caring Hands PCT of the year award. The PCT is a very important part of the patient care team as they extend the care of the nurse through positive interaction with patients and visitors by anticipating needs. 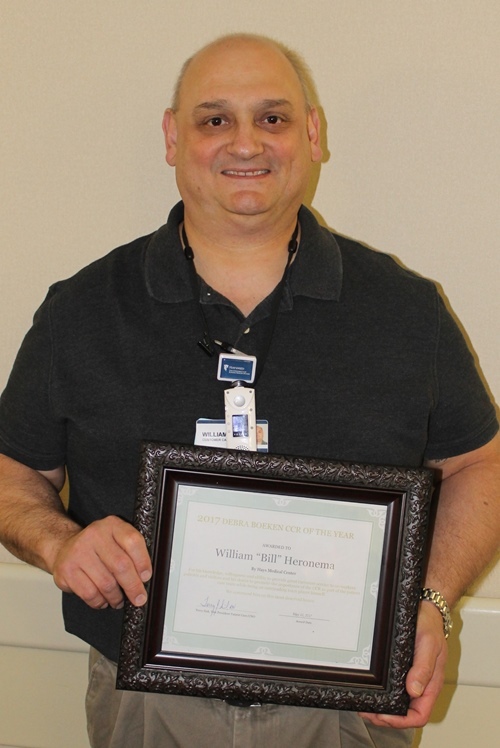 Bill Heronema, Customer Care Representative (CCR) was named the Debra Boeken CCR of the Year. A CCR serves as the face of the unit and often sets the tone for how our patients’ family members and other visitors see the hospital and the care provided. The Lanita Smith LPN of the Year award was given to Rhonda Stramel. The LPN of the Year award is named after Smith, a former nurse that took pride in her role as an LPN and her ability to positively impact a patient’s life as a nurse in many different roles at HaysMed. 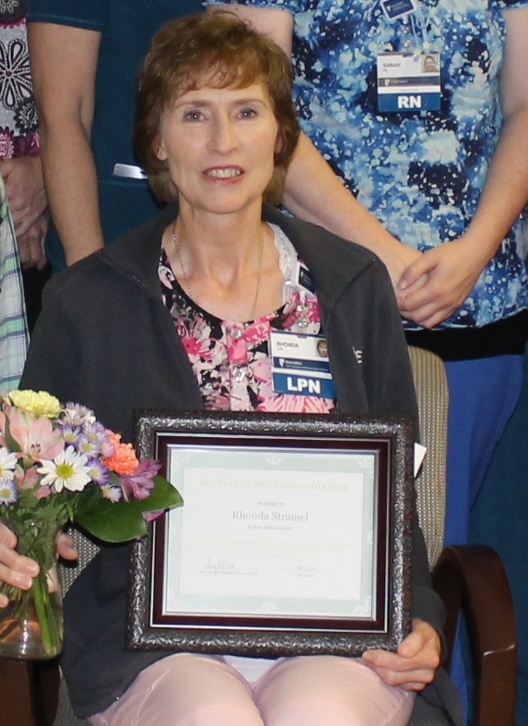 This award honors an LPN who displays many of the same characteristics that Smith had including kindness, compassion, concern and friendliness all the while being a great member of the patient care team. Rios works mainly on the Bone, Joint and Spine Center and has been an Associate of HaysMed since 2015. Heronema works in ICU and has been with HaysMed since 2013. Stramel works at the Medical Oncology Clinic of the Dreiling/Schmidt Cancer Institute and has been at HaysMed since 1978. HAYS, Kansas (May 15, 2017)— On Friday, May 5th, HaysMed officials honored their first ever DAISY Team Award members. Winning the award was the Peri-Operative Process Improvement Team for their actions in improving the experience of Cataract Surgery patients while reducing the length of stay and improving patient safety. Peri-Operative Director Sarah Green said, “I am very impressed by how focused this team was on making a difference and what an amazing outcome resulted from the work done over a series of several weeks.” Team members represented PACU (Post Anesthesia Care Unit or “Recovery”), Ambulatory Surgery, OR, Anesthesiology Associates and Eye Specialists Clinic. Terry Siek, Vice President of Patient Care/CNO said of the winning nomination, “this is such a good example of what can be accomplished when people work together and the ultimate winners are HaysMed patients! I congratulate the team on being willing to not see any barriers while working to make improvements.” Samantha Sramek, RN, submitted the nomination. Peri-Operative Associates participating in this Process Improvement Team were Samantha Sramek, Lisa Gagnon, Anne Marie Hager, Teri Hart, Traci Jacobs, Amy Ranker, Jodi Schmidtberger, Caitlyn Dreitz, Susie Kohlrus, Jacque Krueger, Bridget Malir, Abby Schlabach, Mary Beth Sell, Amanda Tibbits, Taylor Albers, Deb Bohm, Emily LaBarge, Carey Lewis, Carol Linenberger, Megan Richard, Danielle Vonfeldt, Katie Wendell, Melissa Portenier and Sarah Green. Anesthesiology Associates of Hays team members included Dave Bose, Krista Garrison, Dr. Keith Green, Dr. David Lenser, Dr. Patrick Marecic, Dr. Joe Menendez, Dennis Muldrew, Candice Norris, Marc Polson, Kari Ryan and Cole Wiggs. Dr. John Pokorny of Eye Specialists was also an integral member of the collaboration. The DAISY Team Award was founded by the DAISY Foundation as a way to recognize that while an idea to achieve better patient and family outcomes may start with one individual, it often takes an entire team to implement successfully. Plans are to award a DAISY Team each year in conjunction with Nurses Week. HaysMed also partners with the DAISY Foundation to present a quarterly award to individual nurses who exhibit compassion, kindness and concern while providing exemplary patient care. Hays, Kan. (May 15, 2017) HaysMed’s Wound Healing and Hyperbaric Center, part of The University of Kansas Health System, has been recognized with a national award for clinical excellence by Healogics, the nation’s leading and largest wound care management company. The Wound Healing Center achieved outstanding clinical outcomes for 12 consecutive months, including patient satisfaction higher than 92 percent, and a wound healing rate of at least 91 percent in less than 31 median days. Out of 630 Centers eligible for the Center of Distinction award, 334 achieved this honor in 2016. The Center was designated a Center of Distinction in 2015 and 2016 which garners it as a Center of Excellence for 2016. The Wound Care Center® is a member of the Healogics network of nearly 800 Centers, with access to benchmarking data and proven experience treating approximately 2.5 million chronic wounds. The Wound Healing Center offers highly specialized wound care to patients suffering from diabetic ulcers, pressure ulcers, infections and other chronic wounds which have not healed in a reasonable amount of time. Some of the leading-edge treatments offered at the Wound Care Center include negative pressure wound therapy, debridement, application of cellular-based tissue or skin substitutes to the wound, offloading or total contact casts and hyperbaric oxygen therapy. HAYS, Kansas (May 15, 2017)— Vanessa Barnett, Telemetry Department, was recently awarded HaysMed’s first Associate Spirit Award. 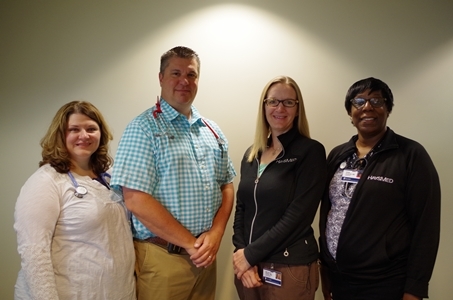 The Associate Spirit Award recognizes an outstanding Associate who has gone above and beyond their daily job duties to care for a patient, visitor or Associate at HaysMed, part of The University of Kansas Health System. A patient’s husband was trying to find a babysitter for their infant son while his wife was in the hospital. They were new to Hays and did not have many contacts or close family that could help. Barnett offered to watch the infant, after arranging for another HaysMed Associate to cover her job duties for that day. Her willingness to help gave the parents peace of mind and made sure that our patients and their families are well taken care of. 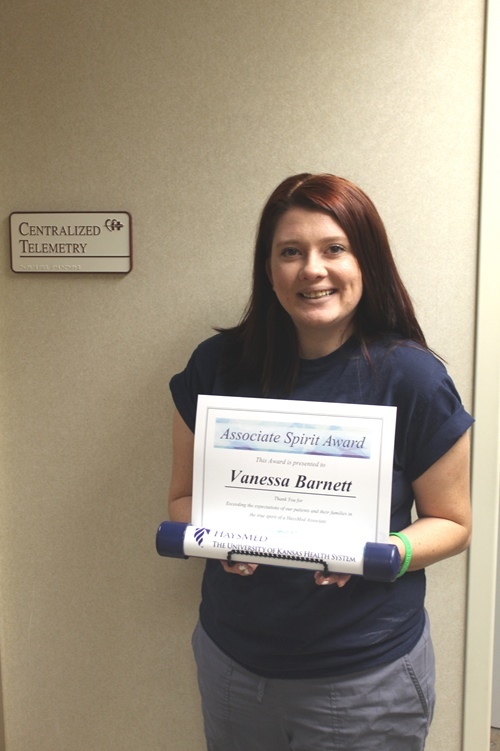 Barnett was awarded the traveling “Associate Spirit Stick”, $50 in chamber cheques, and her own Associate Spirit Award parking spot for 90 days. She is a Telemetry Technician and has been with HaysMed since 2016.